Discerning fact from fiction can be hard. Join us to gain strategies and tools for fact-checking news stories based on methods the pros use so that you too can be a savvy consumer of everyday information. Bring your laptop or borrow one from the Digital Scholarship Center. 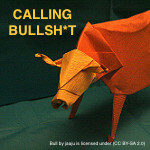 Part of the Libraries' 'Calling Bullsh*t in an Era of Misinformation' workshop series.